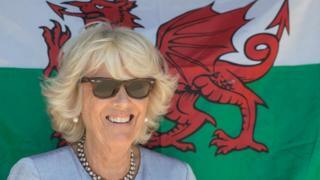 The Duchess of Cornwall took the reins while visiting a rare shire horse farm in Pembrokeshire. The visit to Dyfed Shire Horse Farm in Crymych was part of the Prince of Wales' and the Duchess's annual tour of Wales, which began on Monday. The Duchess rode a horse-drawn carriage around the farm and officially named its newest foal. She told onlookers she was "thrilled" to have named the shire foal, adding: "I didn't realise how rare they were." The royal family tree: who could become king or queen? The family-run business has been breeding the Dyfed bloodline of shire horses for almost 40 years and has previously sold a horse to the Household Cavalry. The farm has been in the same family since 1849. Shire horses are considered "at risk" by the UK Rare Breeds Survival Trust, with numbers estimated to be fewer than 1,500. The royal couple also visited the village of Llangwm in Pembrokeshire, where they met various local groups. They were due to witness chef Owen Hall's attempt at baking the world's largest Welsh cake - but a last-minute flipping setback put an end to these plans. Prince Charles toured the Da Mhile Distillery in Ceredigion - the first UK organic distillery approved by the Soil Association. He also visited St Gwenog's Church in Llanwenog to see unique carvings created by Belgian World War One refugee Joseph Reubens. On Tuesday evening the royal couple will host a music and drama evening at the prince's Welsh home in Carmarthenshire - featuring performances from Wynne Evans, royal harpist Anne Denholm and students from the Royal Welsh College of Music and Drama.